I speak English (no surprise). I can also speak German, though more poorly than when I was in college. And I can understand a handful of Spanish, Italian, and Chinese words. But I am completely hopeless when it comes to Russian, Hindi, Tagalog, and hundreds of other languages. It’s a shame, but I know I’m not alone. Language differences are both a hurdle to common understanding and a window into cultural differences. Which is why linguists, sociologists, and archaeologists are so intent on shedding light on the origin question. 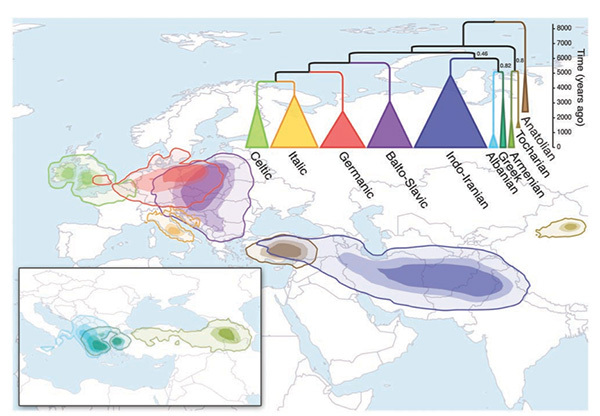 Research published today in the journal Science tries to trace the origin of the Indo-European language family, the largest in terms of native speakers and geographic distribution. There are nearly 450 languages and dialects in the family, including English, German, the Romance languages, Hindi, Russian, and many others. If you haven’t studied them, most of these languages may seem like Greek to you.¹ But many of their words are surprisingly similar, even to the layperson. Take “three”, for example. In German, it’s drei, in Spanish it’s tres, in Greek it’s tria, and in Urdu (spoken in Pakistan and parts of India) it’s pronounced theen. There are two prevailing theories about the origin of the Indo-European language family. The first proposes that the Kurgan people, a culture common to nomadic herders living on the steppe between and north of the Black and Caspian seas, first started spreading its language some 5,000 years ago. Recent archaeological and linguistic data provide evidence for this hypothesis. The other theory says farmers in Anatolia, or present-day Turkey, spread their tongue along with their farming techniques about 8,000 to 9,000 years ago. It’s the nomad hypothesis versus the farmer hypothesis. Under the nomadic theory, it’s easy to imagine a more violent expansion of the culture and language, though the Kurgan diffusion may have been peaceful, too. 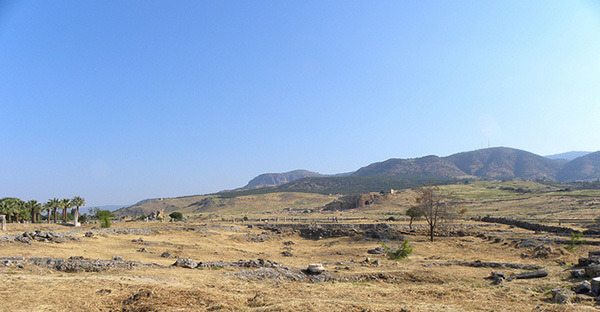 The Anatolian expansion, though, was almost certainly more peaceful, with the language following the adoption of technologically advanced farming techniques. Both sides have their staunch supporters in academia, but today’s Science paper gives new ammunition to Anatolian advocates. Quentin Atkinson, a senior lecturer at the University of Auckland in New Zealand, and his co-authors started by borrowing from the toolkits of epidemiologists and conservation biologists, using computer models that were first developed to trace the origin of diseases and the geographic ancestry of different species. They fed the models geographic and linguistic data from 103 ancient and modern-day Indo-European languages. Their results supported the Anatolian hypothesis regardless of which model variables they tuned. Cladogram and map of the diversification of various Indo-European languages. From Bouckaert et al. 2012 (cited and linked below). The spread of farming was probably a big driving force behind the geographic expansion of the Indo-European family, Atkinson and his colleagues said, but it wasn’t the only one. They point out that languages continued to spread and diversify well after agriculture was established in many areas, suggesting other factors. While their findings probably won’t settle the debate between the Kurgan and Anatolian camps any time soon, they do provide an intriguing look into the common ancestry shared by so many of our native tongues.